Dave clues in on one of the key components of making money. Do you have a skill or a product that can make people’s lives better? That’s probably your key to making money. I see this all the time, particularly when it comes to politics. If you’ve already made up your mind before you sit down, you’re not going to learn anything. If you’re going to sit down to learn something, don’t waste your time by coming at it with preconceptions. Ever notice how the people who seem to get ahead in life are the ones who are passionate about what they’re doing? There’s a big connection there. People will always pay for the combination of passion and skill. Artfire is a site somewhat like the previously-mentioned Etsy. Both focus on handmade goods and provide a platform for people to make items at home and sell them to a large audience. I often look at these sites for gift ideas (things I’ll make myself to give as gifts) and sometimes as a place to purchase a gift. It’s also a powerful way for people with an artistic or crafty bent to make money on the side. This is the song I’m trying to learn on the piano right now. I’m going to guess it’s going to sound familiar to an awful lot of you. I would far rather hang out with a great person without much money than an awful person with a lot of money. You can decide for yourself who is worth paying attention to. I was there less than a week ago. This was one of the two highlights for me. Something about this painting just lit up the room for me. Thanks to Dawn Zarimba for the wonderful photo of this painting hanging in the gallery. I’m happiest not when I’m making money, but when I’m creating something. Money is a nice reward that comes later. It’s the act of doing something that’s exhilirating. I had never appreciated Pissarro’s art until my visit to the Art Institute of Chicago last weekend. 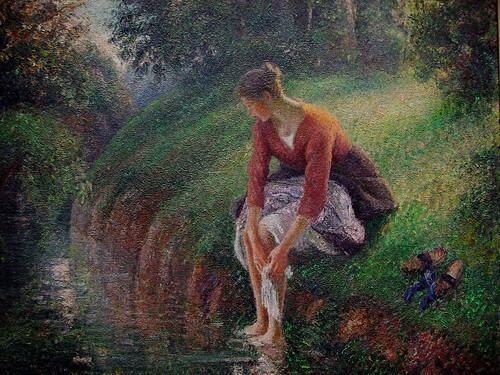 Many paintings by him spoke to me, but the one that really stood out to me was this one, Woman Bathing Her Feet in a Brook (1894/95). 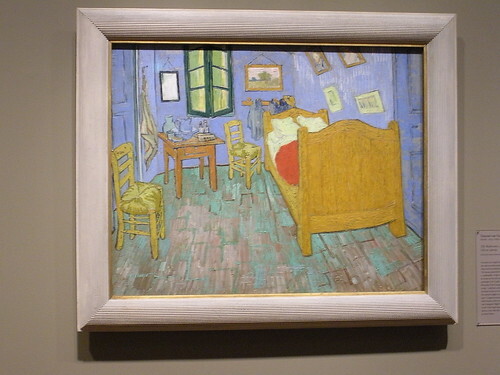 This was easily my daughter’s favorite painting at the entire museum (and one of mine, too!). Thanks to one2c900d for the picture! People often seem nostalgic for the great times of the past. In truth, though, the past wasn’t really all that better than today. As humans, we tend to remember the good times and forget the bad ones, so the past often looks pretty good. One can never really roll back the clock to some earlier great times. Instead, we have to move forward from where we’re at.